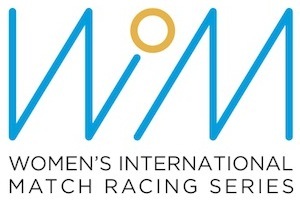 In a powerful Westerly breeze on Sydney Harbour, Juliet Costanzo and her team of elder sister Clare, Jess Angus, Ann Scholten and Emma Rankin became Australia’s newest Women’s Match Racing National Champion, defeating New Zealand’s Celia Willison 3-0 in the Finals. Epic conditions were in order for the final day, with winds averaging 20 knots and the biggest gust on record topping 35 knots. The Race Committee got the teams out on time and in a light northerly wind to start the day, with the semi-finals getting underway with Round Robin winner, Costanzo matched up against the CYCA’s India Howard. The girls from the Royal Prince Alfred Yacht Club only needed two matches to dispatch Howard on a difficult race track as the breeze fought its way round to the west. In the other semi-final, Celia Willison gave it their all against Charlotte Griffin from the Royal Sydney Yacht Squadron. Both teams have traded blows throughout the competition and today’s semi-final dust-up was exactly the same and went to a third and deciding race. Celia, only sailing through to the Finals on the last run of the race after Griffin overlaid into the finish and broached. With the winds building in the last flight of the semi-finals, the Race Committee advised the teams to take refuge behind Clark Island, dropping their mains and remaining under tow till it was safe for racing to continue again. Holding the teams under postponement for a 20-minute break seemed key for the Race Committee as the breeze dropped down to 14-22 knots, enabling the Finals to commence. In the petit-finals, after a disastrous first race, hooking the top mark, India Howard and her team of Elyse Guervara-Rattray, Dana Tavener, Katherine Shannon and Jaime Swavley outsailed the RSYS’s Charlotte Griffin to take a come-from-behind victory and steal third overall for the week. In the Finals, both teams fought for every inch around the race track but superior boat handling enabling fast tacks, sets and drops saw Juliet Costanzo take out the series in commanding styling. Costanzo led at nearly every turning mark and took out her first Women’s National title as helm with an unbelievable scorecard of 19-2 over the three-day event. This is Juliet’s second National title, having last won the event as crew for her sister, Clare, back in 2016. The CYCA will now host the Australian Match Racing Championship from Friday 21 to Sunday 23 September.